Low Profile metal braces are the most common type of braces for orthodontic patients. Today's metal braces are much smaller, flatter, and more comfortable than in the past. 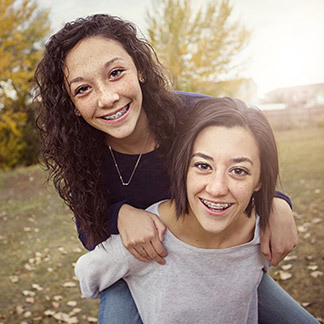 Patients of all ages choose metal braces to help them achieve straight, beautiful smiles. Brackets — Brackets are attached to the teeth using special adhesive that bonds them to the tooth surface and holds them in place. Ligature Elastic (also known as the “o-rings”) — Elastics, or rubber bands, are the colored ties that hold the archwires to the brackets. Your orthodontist will change the elastics at each appointment. Elastics may come in a variety of colors. Low profile metal braces are still the most popular, quickest, and most cost-effective orthodontic treatment available. Your orthodontist can help you determine what treatment is best for your individual case. Please contact our practice to schedule an appointment and learn more about how braces can enhance your smile.